Shirts With Random Triangles: Star Wars enters the galaxy of college sports apparel. 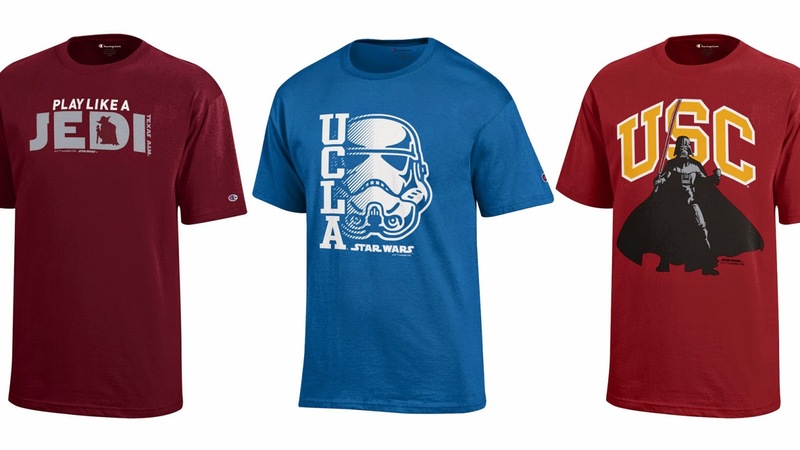 Star Wars enters the galaxy of college sports apparel. From the "why did this not happen before now" dept. comes word that Star Wars has finally succumbed to the Dark Side of the Force and has gotten into the college apparel business. The Star Wars official site hypes the new line with all the pompousness you would expect from a media property eaten by a Sarlacc bought by Disney. "Whether a member of an undefeated empire or part of a rebel alliance, collegiate sports fans know what it means to be part of a legacy. Now college sports fans can celebrate their school pride with the power of the Force sporting a new collection of apparel and accessories featuring iconic designs from the Star Wars saga! Everything you need for an intergalactic sports showdown: T-shirts, caps, throws, outerwear, lunchboxes, coolers, and more featuring each college’s unique graphics and favorite Star Wars characters like Yoda, Darth Vader, stormtroopers, and more. Gear up the friends and family for the next home game or make the jump to lightspeed with your own Star Wars tailgate at a campus not too far, far away…"
Shirts will be available in Kohl's and Old Navy, among other retailers. Schools represented include Alabama, USC, Boise State, and Georgia. In other words, this is your lucky day, Chris Conley. And yes, Ole Miss Star Wars gear will be available. If there's not an Admiral Ackbar Ole Miss t-shirt, we riot.